I stop for a red light, and glance in the rear view mirror. A well-coiffed couple pulls up behind me in a Mercedes. He’s got the wheel in one hand, and his head in the other. She’s got a map in one hand and nothing in the other, but both hands jab the air as she talks animatedly at him. I can almost see a spray of spittle from where I sit. He rolls his eyes. She drops the map, turns on him, and talks more emphatically than before. He covers his eyes with his hand; I’m pretty sure they’re still rolling back there behind his palm. She starts making air quotes. Like, a LOT of air quotes. I look at the wheel, here in my own hands, then turn my gaze toward the passenger side, where my purse, the groceries, a pair of binoculars, and a collection of cloth shopping bags litter the seat. The light turns green. I smile and drive on. This post made me giggle and smile this morning. 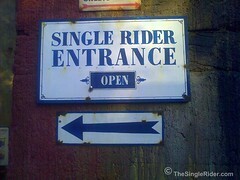 Rock on, Single Rider!